Courtesy of MOMA, Gift of NTT DOCOMO, Inc. The Museum of Modern Art (MoMa) in New York City has acquired a daring new piece to add to its collection: emoji. The modern art institution has announced the acquisition of a collection of some of the earliest known keyboard pictographs. 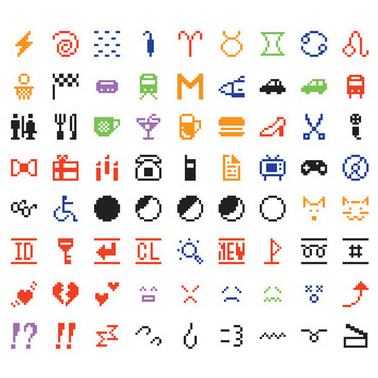 Japanese mobile provider NTT DoCoMo produced the 176 emoji designed under the supervision of Shigetaka Kurita as early as 1999. While the images are now often used to add pizzazz to text or tweets, their original purpose was more practical, according to MoMa architecture and design specialist Paul Galloway. Of the 176 original emoji, only five were faces, he pointed out. Japanese telephone carriers initially used them for practical alerts such as weather warnings, according to the New York Times. But it was the faces and hearts—and now, poop—that became the most popular, as users continued to demand new ways of expressing themselves. Apple released a larger set of emojis in 2011 as a keyboard for its devices, according to a press release from MoMa, and the pictographs have continued to evolve on different platforms, taking on varying styles and expressions across platforms such as iPhone messaging, Facebook and Twitter. While some critics have slammed emoji, such as a New York Magazine article that described them in part as "small invasive cartoon army of faces and vehicles and flags and food and symbols trying to topple the millennia-long reign of words," Galloway insists on both their possibility for depth and their connection to the past. Some of the earliest pictographs come from the ancient Egyptians in the form of hieroglyphs, and this connection is not lost on MoMa’s curators. “It does bring us full circle to the beginning of language,” he said.